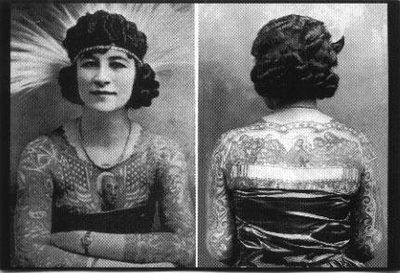 The tattooed lady, was born Anna Mae Burlingston in Linwood, Wisconsin, the daughter of the Norwegian immigrant and farmer Gunder Huseland, who at the time went by the name Frank Burlingston, and his wife Amma Mabel Mason. Anna was one of seven children. The farm was located on an island in the Wisconsin River that was referred to as "Treasure Island" or "Burlingston Island." In 1907 the family moved to Colville, Washington, and shortly thereafter, Anna's father died. She and two of her sisters went to work as domestic servants in Spokane, Washington, to help support the family. She met the tattoo artist Charles "Red" Gibbons in Spokane; he was working in an arcade and had been tattooing professionally for a number of years. They married in Spokane in 1912; the couple had one daughter. After several years of marriage, Gibbons and her husband decided that they would make a better living if she became a performing tattooed lady, so Charles Gibbons tattooed Anna with images from her favorite classical religious artwork, in full color. Anna Gibbons was a deeply religious woman and a lifetime member of the Episcopalian Church. Her tattoos included illustrations of angels and saints as well as patriotic images, including George Washington. 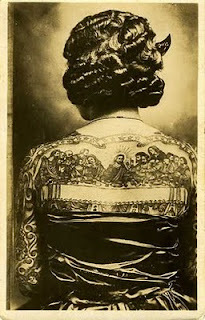 Tattooed men and women have been a staple of the American sideshow since the mid-nineteenth century. The first American tattooed man began working in the 1840s, and tattooed women, in the 1880s. As sideshows began to tour with circuses, just before the Civil War, Americans were introduced to a number of professionally employed oddities. Popular sideshow freaks included Siamese, or conjoined, twins; midgets (now referred to as "little people"); dwarves ; and fat men and women as well as snake charmers, sword swallowers, fire-eaters, and exotic dancers. 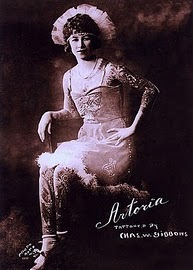 Gibbons's first season as "Artoria, tattooed girl" was in 1919, with the Pete Kortes Show. She then went on to work with the Ringling Bros. and Barnum and Bailey Circus's "Greatest Show on Earth" from 1920 until 1924, after which she joined the Hagenbeck-Wallace Sideshow Annex. In 1925 and 1926 she worked for the Kortes and McKay's Museum in Los Angeles; dime museums were popular venues for sideshow freaks. For the 1927 and 1931 seasons, Gibbons was back with Ringling Bros., working for the Clyde Ingalls Sideshow. Both Gibbons and her husband worked for the Foley and Burk Shows during 1932 and 1933 and for the Johnny J. Jones Sideshow during the mid-1930s. Anna worked as Artoria in the sideshow while Charles tattooed customers. 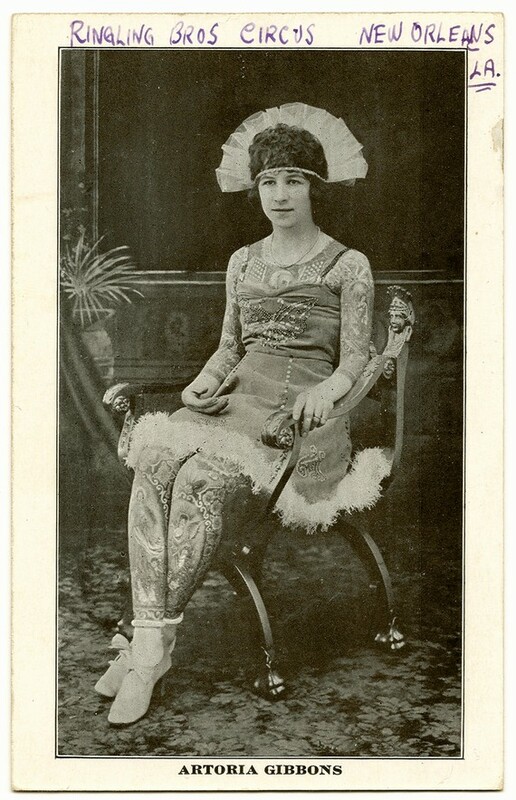 A sideshow tattooed lady would stand on a platform or small stage within the sideshow tent and talk about herself--though the stories that sideshow performers told to audiences were usually false. The stories were intended to entertain audiences and were often based on popular culture of the day. 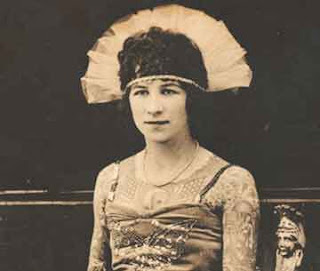 The tattooed lady also wore clothing that revealed her tattooed body; Artoria is usually pictured wearing a skirt that falls just above her knees and a sleeveless top. Because her tattoos were a major part of the exhibition, they had to be visible. When they were not with the sideshow, which toured seasonally from April through October, the Gibbonses lived in California, where Charles tattooed regularly in arcades and amusement parks. Anna retired from the sideshow temporarily in 1947 to care for her ailing husband. Charles was the victim of both a brutal robbery and a construction accident; following several unsuccessful surgeries, he completely lost his vision in 1946. By 1956 Gibbons decided to return to work, taking Charles with her. She had waited to return to show business until her husband was able to travel with her, which he did until his death in 1964. During the 1970s, Gibbons worked for several carnivals, including the Dell and Travis Carnival. This period saw the release of Arthur H. Lewis's book Carnival (1970), an account of carnival life that Lewis researched through interviews with legendary performers. Carnival contains one of the most oft-told tales about Gibbons's sideshow beginnings--namely, that when Gibbons was a teenager, she snuck out to see a visiting sideshow, met a tattoo artist, and ran away and married him in order to see the world. Although this story was repeatedly told, by Gibbons and others, it was a fiction--the type of tale that sideshow performers included as a part of their act. In 1978 Gibbons was hired by Ward Hall, the owner of Hall and Christ Sideshow, whom she had met years earlier while working at Hubert's Dime Museum in New York's Times Square. This was her last sideshow. Gibbons retired from the Hall and Christ Sideshow in 1981, and at the end of the carnival season she went to live with her daughter's family in Tennessee. 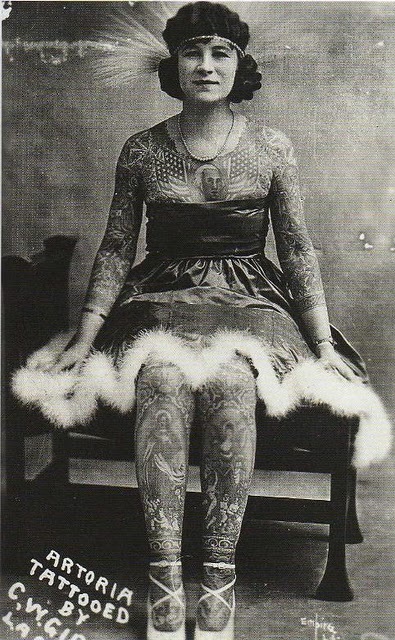 When Gibbons died at age ninety-one, she had performed as a tattooed lady for well more than fifty years. She saw many changes in the American circus and sideshow over the course of her career: the circus went from being one of the main entertainment venues at the beginning of the twentieth century to just one of many popular culture options available at the end of the century. In addition, views on tattooing and tattoos changed radically. By the time Gibbons retired, tattooed ladies were no longer a novelty; many people, including women, had tattoos. She was one of the last tattooed ladies to be actively working in the United States. quite honestly one of the most fascinating women ever. To come from a poor background and at an early age embark on an odd and wild lifestyle. I read this artical several years ago and was really pleased to find it on the web........... very well written and about a wonderful woman..I have had a few origional postcards dating from the 1920s and have always been fascinated by her.